A local bus-stop shelter was recently spray-painted with "Aoteoroa is not for sale." The tagging was a response to the Crafar Farm deal. In a similar vein last week, there were calls from NZ First and The Greens (unlikely bedmates) for the government to 'do something' about house sales to foreigners, in particular, Asians. Foreign investors, they say, are locking New Zealanders out of the housing market with their preparedness to pay good money for property. It's not fair, they say. It's not looking after our own first. For every buyer of a house, there's a seller. Before asking politicians to regulate against freedom to purchase property, owners should think about what that means for them. Home from work and having a happy hour glass of bubbly, feeling a bit more benign towards mankind as Michael Laws would put it, I came across this and thought I'd just cut and paste it. I can theorise till the cows come home about why government shouldn't be involved in wage subsidies, skills training, job placement etc but they are and this is at least one good, heart-warming even, result. "I’ve learnt a lot and my knowledge is growing all the time." Late one night last year, an elderly man found himself harassed by a group outside a Wellington bar. Afraid and unable to escape the situation, he sought refuge inside the bar. Henry Lemalu was working security when the man came up and asked him for help. A quiet-spoken, steadfast individual, Henry was relatively new to security but he knew what to do. For employer Darryl Stonnell of First Contact Security, it would have come as no surprise to see his trainee handle the situation so well. Intelligent, committed and worthy are the words Darryl used when he nominated Henry for the Security Trainee of the Year 2012. And yet, 18 months before he won the industry-wide award, Henry Lomalu was so afraid he wouldn’t measure up, especially with writing and theory, that it took all his courage not to walk away from the opportunity. Struggling to find work on the Unemployment Benefit back in 2011, Henry was offered a place on an eight-week training course with a security company, First Contact. The company partners with Work and Income, training unemployed clients with the aim of moving them into work or further training. It was the first time Henry had studied or trained since leaving school. “I was so afraid that I almost had second thoughts. I wasn’t sure if I was capable or what I was getting myself into. But I’m pleased I convinced myself that this was something I could do and that I needed to do”, says Henry. He shouldn’t have worried. Not only did he pass and gain a job, but First Contact saw the potential in Henry and encouraged him to go for the National Certificate in Security. Henry is now a team leader and studying towards the Level 3 certificate. He says he’s proud of what he’s done so far. For Darryl, the reward is not only gaining a valuable employee but seeing Henry grow in confidence and skill. He says he is impressed by Henry’s determination and hopes that winning the award will prove to Henry that he is capable of achieving even more. The private members bill legislating for an increase of taxpayer-funded Paid Parental Leave (PPL) from 14 to 26 weeks is back in parliament today. Bear in mind, if lobbyists get 6 months it'll only be a matter of time before they want 1 year. The main argument goes that bonding and breastfeeding are so important they should be encouraged as much as possible. If you look at how mothers are behaving after a birth most already appreciate that. NZ statistics analysed data from 2002 -2005 when the provision was for 12 weeks PPL. Did most mothers return to work when their leave entitlement ran out? 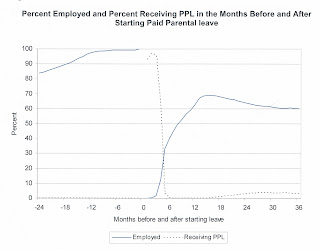 4 months after starting PPL only 12.5 percent were back working - at 5 months, only 33 percent. 30 percent had not returned to work after 18 months. So, outside of 12 weeks, the majority of mothers were already funding motherhood themselves. They don't need the taxpayer to make it possible for them to stay home. 60.4 percent were aged 30 or older, probably well-established in work and earnings. The average monthly earnings before PPL were $3,450. Mothers in the 99th percentile had monthly earnings of $10,490 but under the proposed legislation would still be getting 6 months tax-payer funded PPL. 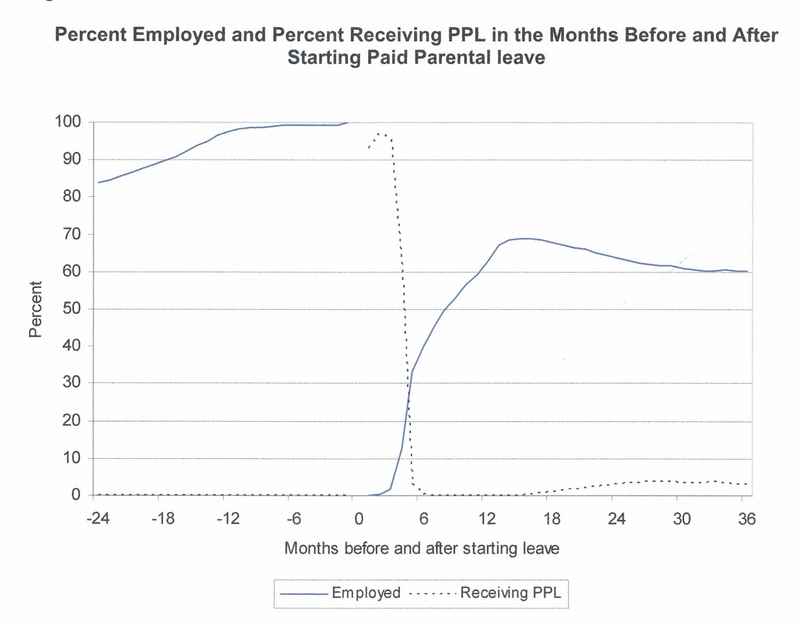 Finally, "Employment and return to work rates were higher for those who had earned the most before starting parental leave. " The people who least need taxpayer support return to work faster anyway. Those people commenting here and elsewhere about their lack of sympathy for farmers and opposition to any assistance will be pleased to know that Work and Income has not made any payments to farmers since the official drought declaration. A spokesman for Work and Income said no rural assistance payments had been made since drought had been declared. As I pointed out yesterday on an earlier thread these payments will be very hard to access and are only for people in extreme hardship. Personally I don't begrudge it. Attitudes towards welfare may differ substantially even across otherwise similar countries, but the basic determinants of solidarity and willingness to help are understood well enough. An interesting summary of the quantitative and qualitative research is provided by Horton and Gregory (2009: 110–30). It shows, first of all, that most people are not indifferent to the distress of others. Most people, however, have strong views on what they expect from those receiving help. The single biggest deterrent to generosity is fear of being taken advantage of. Free-riding is so destructive that it need not even be especially widespread in order to undermine people’s willingness to help. At the same time, nothing boosts the willingness to be generous as much as the confidence that most recipients of aid will collaborate, and do their best to improve their own situation. The bottom line of the research is that people empathise with those who try – even if they try unsuccessfully. This is such a strong determinant of people’s willingness to help others that it trumps all other considerations. An interesting illustration is an experimental study in which participants are presented with a set of fictional characters, and are asked to evaluate the degree to which they are deserving (ibid.:123–30). One of the characters has entered hard times through no fault of his own, receives benefits now, has the opportunity to change his situation, but does not do so. Another character has only himself to blame for having come on hard times, but is now doing his best to get his life back on track again. Participants empathised more strongly with the latter character. People are not primarily interested in who is to blame for a situation, but in who is doing their best to remedy the situation. It seems to me the phrase 'beneficiary bashing' was coined in the 1990s and originally used to describe Ruth Richardson's benefit cuts. For some time I've been reflecting that the Left are now very quick to cry beneficiary bashing whenever government attempts to reform welfare IN ANY WAY. But this National government has never cut benefit payments. In fact they've introduced more protection for benefit levels through indexing. National hasn't reduced the incomes of beneficiaries. Policies of (usually) the political Left though, like tobacco and alcohol taxes, supposed environmentally-friendly fuel and energy taxes, a proposed fat tax, or Labour's capital gains tax, actually do or will hurt the lowest income people the most. Does anybody cry 'beneficiary basher' when Tariana Turia ratchets up the price of a cigarette yet again? Despite Maori women being the most prolific users of welfare and the biggest users of tobacco? I was just reading a paper that shows spending on alcohol and tobacco accounts for 10.7 percent of the incomes of those in the lowest quintile in the UK. The same paper shows how government interference in the housing market - and the UK has the same affordability problem as NZ - leads to high rents, again disproportionately hurting the working poor and beneficiaries. Do environmentalists seeking to prevent urban sprawl get called beneficiary bashers? Do climate change activists who campaigned for the ETS get called beneficiary bashers? But offer free long-acting contraception to a beneficiary sole parent and her teenage daughter and you are not only a basher but a eugenicist! Everything aimed at trying to better the material and social lot of people on welfare and their children - work obligations for those able, short-term retention of benefit while transitioning into work, requirement to partake in child health and educational facilities, income management to ensure essentials get paid for - are all labelled punitive and beneficiary bashing. Perhaps we should turn the term on the Left at every occasion they suggest making life financially tougher for those on low incomes, be they beneficiaries or workers (or both). Even BUY NZ could be construed as a beneficiary bashing campaign on the premise most cannot afford such indulgent nationalism. It'd be drawing a longish bow but isn't that what the Greens, Mana and Labour do every time they invoke the mantra? Employers have slammed the government's scorecard on creating jobs and developing a viable growth agenda, a survey of business owners has found. The Ernst & Young/Sunday Star-Times Job Creation Survey also indicated how widespread employers' concerns over unemployment and job creation are, with an overwhelming majority expecting it to be a major issue at the next General Election. The survey participants were owners or managers, mainly mid-market, in a variety of industries nationwide. It found that just over half of those businesses (54 per cent) had hired someone in the last year, but slightly less than that (51 per cent) intended hiring anyone in the year ahead. When asked if they thought job creation was the responsibility of the government, the private sector or a combination of both, an overwhelming majority (79 per cent) said both. However most were unimpressed with the government's contribution to that process. What's missing is any in indication of whether the employer wants the government to be more active in loosening up employment legislation, wage controls, tax legislation, monetary policy etc. or they want the government to spend more on job creation schemes, wage subsidies, training, start-up subsidies etc. It's depressing that 79 percent think job creation is both the responsibility of government and the private sector. But if I was answering the question precisely, at this point I'd have to agree. The government and only the government can extract itself from activities that contribute to unemployment and business failure. National has done a few things, for example the 90 day work law, but they need to do far more. Especially big stuff like lowering corporate tax. Not tweeking stuff. "We need a hands-on government, not a hands-off one and I think the message from the business people who have been surveyed here is that they think this is a hands-off government that is not playing its part." That's not the message I get. I don't get any clear message because the questions (those reported) weren't specific enough. And he shouldn't take it as a sign employers are so unhappy with the government they will vote to change it.